Click to Visit other Challenge Participants! Perfection is my drug of choice. Always has been. In grade school, I was once held after school to finish a project that I had been too finicky to finish in the scheduled time. And I don’t mean, after school, that day. I mean after school that year. The thing was supposed to be an American flag (the teacher was ex-military), and at the end of fourth grade, I was still about nine stripes short of that. My parents brought me in the day after Summer Vacation started, and I sat in an empty classroom, gluing red, white, and blue crepe paper squares to cardboard. All day. After all, the teacher wasn’t going anywhere, and I wasn’t going anywhere. I’d like to say that I learned my lesson. That henceforward, I balanced my perfectionism with given time restraints, and produced perfectly adequate results. But what I did learn was that Mrs. Beth Dawson and the United States Marine Corps do not really have any significant quality-control standards for crepe paper flags. I don’t think I’ll ever triumph over my perfection addiction. But I’m gradually learning to stop saying “I can fix this” and start saying “the next one will be better.” I’m learning that I can move toward perfection with motion, rather than fixation. I am learning to move on, without giving up the overall ideal. So, there you are. A post on the letter P. And now, I’m moving on. I spent all day at work, and then wound up climbing around in a tree cutting down branches. Pretty sure it was a killer attack tree. The pink blossoms must’ve been some kind of display of aggression. 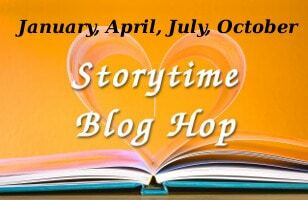 The Storytime Blog Hop for Speculative Fiction will be April 27th. I’m working on my story, right now, and I hope to see everybody then. I have always felt perfection is an illusion that allows us to measure possibilities, so we never run out of goals or a star in the sky to reach for. We aren’t really meant to achieve it because is like hope when used correctly. It just keeps us growing and moving forward. When used in the negative it is a destructive force that rips apart and destroys anything in its path, especially the intangible. Does it plague me? Yup and uses fear to stop me cold if I allow it. I am also learning to say the next one will be better. You think it would not be as hard it is to do, but it is. learned there is no such thing as perfection. Just doing the ultimate best you can do, then do some more. Hey, it’s good to “meet” you. Thanks for stopping by. I know you’re right about perfection not existing, but do I ever chase it, anyway!